Relics of many of the world’s great civilizations are still scattered across the Jordanian landscape today. This May 10-20, 2019: One of our most magical and spellbinding tours. Beginners welcome! Join us as we explore the captivating civilizations of Jordan and learn how to take inspiring photographs we can sell for $50, $150 or even $500. All while learning everything you need to know to improve your photography, sell your images, and earn an income from your vacations. Imagine feeling the pride and prestige that come with seeing your photos on the pages of travel magazines around the world or on the front page of top stock photography sites. If you’ve ever dreamed of being able to travel to far-off exotic locations and capture images that you can sell to help pay for your next adventure… this expedition is for you. Join us May 10-20, 2019, as we journey back in time and discover the “lost city” of Petra—one of the renowned seven wonders of the modern world—with our cameras in hand. You’ll explore this lavish tapestry of cultures as you traverse vibrant cities, ancient ruins, breathtaking landscapes, and star-dazzled nighttime desert skies. Practicing your night photography, people photography, humanitarian-style journalism, and more. You’ll spend 10 days exploring all that Jordan has to offer in a way you never could as a typical tourist—safely with professional photographers and humanitarian filmmakers Joe and Kathy Sindorf right by your side, ready to share their tips and secrets with you for creating images you can sell, again and again. If Jordan isn’t on your bucket list, it should be! Home to some of mankind’s earliest settlements, Jordan is a land steeped in history. We’ll explore the narrow, colorful, fragrant corridors of the bustling souks (markets) in Amman… climb over the millennia-old ruins of its ancient Citadel… and remove our shoes and silently witness prayers at the splendid King Abdullah Mosque. Then, wake up early the next morning to photograph the first rays of sunrise as they illuminate the rugged Judean hills across the sea in Israel. We’ll venture through the Siq, its beautiful red-hued sandstone cliffs towering 500 feet high on either side. And emerge to the jaw-dropping site of the most famous archeological façade in the world—The Treasury of Petra—reminiscent of Raiders of the Lost Ark: The Last Crusade. Dramatic photo opportunities are endless in this country, even as we form a camel caravan and ride together through this amazing UNESCO World Heritage Site—an experience and a photo opportunity in one. 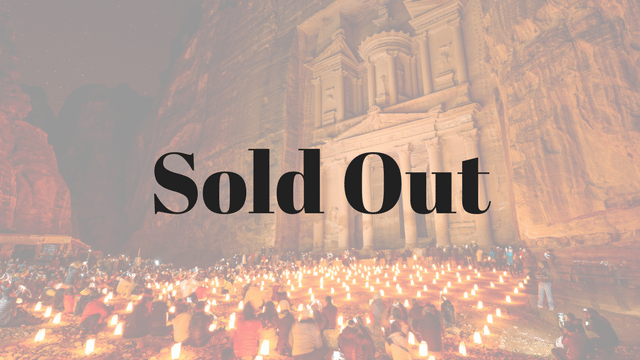 Then, return the next day after dark to experience the magic of Petra by candlelight, spellbound as the red sandstone is illuminated by the soft flickering light of thousands of candles and oil lamps. We’ll even hang around after the other travelers have left and have a unique photographic opportunity to capture the candle-lit magic, without the throngs of people in our photos. You’ll journey through the other-worldly terrain of Wadi Rum, transfixed as the sun slices through its chiseled canyons at dawn and melts the division between rock and sand at dusk. You’ll photograph your footprints in the endless drifts of red sand, before boarding Jeeps to go deeper, photographing the amazing desert vistas reminiscent of movies like Lawrence of Arabia, The Martian, and Rogue One: A Star Wars Story—all of which were filmed here. You’ll capture the stunning view as the sun slips over the boundless horizon, then pull out your tripod and learn the art of night photography as you capture the glittering stars unpolluted by city lights. After playing with night images, you’ll retire for a quiet night’s sleep in a luxury Bedouin tented caravan camp. This May you’ll not only visit Jordan but experience it. You’ll see the world through the eyes of professional photographers and filmmakers, all while learning how to capture what you see in dramatic, vivid, and saleable images. All with careful attention to beginners if you’re just starting out and don’t yet know how to work your camera. No matter your level of ability or experience, every day you’ll see your photography skills grow and improve, turning your travel snapshots into professional images that photo buyers will clamor for. And you don’t need fancy, expensive equipment or a huge complicated lens to take images that sell, either. All you need is a camera and a grasp of the fundamentals of photography… fundamentals you’ll learn through classroom instruction and reviews, supplemented with daily in-field coaching and support as we travel through Jordan. Over the course of 10 days, you’ll see your skills grow faster than you ever thought possible, returning home with images you can be proud of and the know-how to sell them for spare income. Kathy and Joe Sindorf are a husband and wife team of renowned visual instructors. Kathy is a university professor who teaches video, photography, and digital media skills in the classroom and on-location. She’s trained humanitarians in seven countries how to shoot video and tell visual stories that impact their audiences emotionally, so they can raise awareness of important causes around the world. Together, Joe and Kathy have led multiple academic study programs to Jordan where students have learned photography, video, and writing skills while working with refugees who have fled fighting in Syria and ISIS in Iraq. Joe is an award-winning photographer and international humanitarian filmmaker who has worked in more than 75 nations around the world. His work often takes him to places where people are at their worst—in the aftermath of major natural disasters; surviving famine or drought; and suffering intense injustice. He is in Jordan many times each year, working as a humanitarian filmmaker, writer, and photographer, documenting the reality and plight of the refugees who have fled to this safe country. He knows the country intimately, and, together, Joe and Kathy are the perfect hosts and instructors to introduce you to the Jordan they have come to know and love. Joe’s photographs have been published nationally and his video work has won international film festivals, the Emmy Award, the George Foster Peabody Award (often referred to as the Pulitzer Prize for broadcast media), and many others. He is a talented photographer and instructor—not to mention an incredibly approachable person. His patience, knowledge, and friendliness will ensure that everyone, regardless of skill level, feels supported and encouraged. Then now’s your chance to have it all. Not only will you come away with a real passion for this part of the world— having discovered it with a photographer’s eye (and with professional photographers who’ve been to these exact places many times before)—but you’ll also learn all the ins and outs you need to take amazing photos, capture incredible videos… and sell them for cash to fund your next adventure or piece of equipment. Join us for the experience of a lifetime in Petra and Jordan, and we’ll help you transform your photography skills… and your life purpose. Great Escape Publishing is committed to creating tours and experiences that are unlike anything you’ll find elsewhere. Here’s our 4-POINT PROMISE about what you can expect on this expedition and what makes us different. You’ll be part of a small group of like-minded travelers… folks who want to explore, experience, and enjoy what’s unique and authentic about a place. The group size is capped at 12 people, so you get the chance to know everyone in the group, and you get plenty of one-on-one time from your instructor. It’s important to us that our accommodations match the destination. We seek out unique, boutique hotels that match the splendor of the city. From Hacienda-style lodges in Ecuador… to luxury tent camps on the Serengeti in Tanzania… a garden-inspired boutique hotel in Thailand… or a luxury boat in Ha Long Bay… our choice of lodging might just be your favorite part of the trip! Here in Jordan you will stay at five different, hand-picked accommodations, from an award-winning candle-lit eco-lodge to a superior grade Bedouin tented caravan camp in the heart of the desert. We like to explore places the average tourist probably doesn’t know about. We’ve made connections on the ground so we can visit the best sites, markets, festivals, restaurants, cafés, and villages that would be hard to find on your own. We use local guides and we’ve geared our schedule toward photographers, so you can skip right to the heart of Jordan and capture experiences and images the regular tourist never will. Photography tours are a dime a dozen. But try to find a tour that teaches you how to take amazing photos AND how you can sell those images for a nice side income, and you’d be hard pressed. The truth is, a lot of professionals don’t sell their photos anymore because they can make more money selling trips. Or if they do, they aren’t crazy about sharing their photography secrets and their income-earning advice with newbies. But the photographers who lead Great Escape Publishing trips are some of the most generous teachers out there. They know that the need for great photos is only increasing—so the more people who can fill this need, the better for everyone! On this expedition, you’ll have an established, award-winning expert by your side every step of the way, ready to share his professional insights and secrets to help you travel the world and get paid to do so. On a hands-on, boots-on-the-ground expedition like this, you’ll learn travel photography in a fun way… among new friends… and absorb skills faster than you ever thought possible! With daily, in-the-field coaching and feedback, you’ll draw inspiration from the world around you—the ancient architecture, revered archeological treasures, stunning landscapes… all while exploring one of Earth’s oldest civilizations. You’ll return home with invaluable skills, sure to have you exploring the world and turning your stunning images into cash in no time. Not to mention all the memories you’ll make and the people you’ll meet… those you’ll learn with, have fun with, and continue to grow alongside. This will be the trip of a lifetime! And when you’re not taking photos of an ancient city, or capturing the sun setting over the desert sands, or trekking through the Siq to reveal Petra by candlelight… you’ll have time to explore on your own, take photos, and create long-lasting memories that make your experience truly unique. Join us this May and see the world through the eyes of a husband-and-wife team of professional photographers and filmmakers. Walk alongside them and see how they visualize and capture new and exotic locations. Joe and Kathy have both traveled to Jordan many times (leading expeditions and on professional assignments) and they’ll make sure you have the best spot at the best time to capture unique and impressive images. You’ll benefit from one-on-one, in-field instruction on a daily basis, as well as during lessons and review sessions. It’s this kind of learning experience that can improve your skills in record time. What’s more, every attendee will have lifetime access to our private online Facebook group, so you can continue to support each other on your journey and share your successes… and ask your questions… when you return home. Whether you’re just starting out and have little experience, or you’re already an accomplished photographer, you’ll benefit immensely from this expedition. You’ll schedule your flight to arrive on this day at Queen Alia International Airport (AMM). (Note: with international time changes, your flight will likely depart the previous day). You will be personally met at the airport and assisted with your transfer to our brand-new hotel in Amman. Take some time to rest and relax before meeting up with the rest of the group the next morning. Dinner is on your own. After a lovely Middle Eastern breakfast at the hotel, you’ll meet your instructors and fellow attendees to go over the schedule and have your first photography class on camera settings and composition. After class, we’ll visit the oldest sections of Amman. We’ll walk through the bustling Souq (market) with its fragrant and colorful spices, fruits, and vegetables. We’ll stroll through the famous glittering gold souq and find ourselves at the Ottoman-style Grand Husseini Mosque, built on the site of an ancient mosque dating to 640 AD. After touring the prayer rooms of the mosque, we’ll explore the Roman Theater, built during the reign of Antonius Pius (138-161 AD). The oldest falafel restaurant in Amman, Hashem, is our stop for lunch (where the King has been seen dining at times!). After a refreshing lunch, we’ll drive to the ancient Citadel where millennia-old ruins make dramatic photographs, especially at sunset. We return to the hotel for dinner and a laid-back welcome reception. After breakfast, we’ll check out of our Amman hotel and begin our drive south to the jewel of Jordan’s archeological crown… Petra. We’ll check in to the closest hotel to the entrance of this incomparable World Heritage Site and then begin our walk through the narrow Siq, a deep canyon that meanders between beautiful red-hued sandstone cliffs towering more than 500 feet high on either side. At the end of the Siq is the dramatic reveal as the most famous archeological façade in the world comes into view—The Treasury—an elaborate and intricate structure, painstakingly carved into the towering red-rock face centuries ago. This is where Raiders of the Lost Ark: The Last Crusade and many other films were shot! As you wander through Petra, you’ll have ample opportunity to explore the limitless, dramatic photo opportunities on your own. After lunch at the renowned Basin restaurant, we’ll form a camel caravan and ride the entire length of Petra back to The Treasury before returning to our hotel for a drink at one of the oldest bars in the world—The Cave Bar—an original Nabatean Tomb dating back to the time of Christ… and then, take some much-needed rest! We’ll wake to a full Middle Eastern breakfast, and then gather for our first photo review, followed by some leisure time for hiking, spa treatments or shopping. In the middle of the day, we’ll go to the Petra Kitchen for a cooking class, learning alongside a Jordanian chef, as we prepare local dishes found on a typical family’s menu, using fresh ingredients—and then enjoy the food we’ve created together for lunch! We’ll relax with a glass of wine as the afternoon shadows lengthen. Then, as the sun dips below the canyon walls, we’ll meet again at the Siq to enter the magical world of Petra—this time at night, with the red sandstone canyon illuminated by flickering candlelight and the soft, luxurious glow of simple oil lamps. We’ll arrive at The Treasury, bathed in warm light, our voices hushed as live Bedouin music blends with the desert wind, transporting us back to millennia past. Some will shoot the most epic shots of our portfolios, our cameras mounted on tripods, shooting long exposures to capture the magic, while others will prefer to sit quietly, meditating, taking in this rare moment. At the end of the evening, we’ll walk back through the candle-lit Siq… this time more relaxed, pausing for artistic shots that weren’t possible on the way in. Since our guesthouse is the closest to the entrance, we’ll have the shortest distance to walk to a late dinner and to find our rooms! After a delicious breakfast, we’ll depart for Wadi Rum, Jordan’s awe-inspiring, mountainous, high-desert region. We’ll join the ranks of “the lucky few” as we check into our superior grade Bedouin tented caravan camp in the desert expanse of Wadi Rum. After checking in and enjoying lunch, we’ll travel deeper into the desert in four-wheel-drive vehicles to photograph amazing desert vistas, familiar backdrops in movies like The Martian and Rogue One. Then, as the sun sets over the desert, we’ll capture its glory with Joe and Kathy alongside, ensuring we get the best shots. After a delicious Bedouin feast, we’ll sit around the campfire sipping tea or wine and sharing our experiences of this magical country. And for those who wish… we’ll pull out our tripods and learn how to capture the magic of night photography as millions of twinkling stars light up the darkest of night skies—untouched by city light. We’ll rise before the sun. Everything will be dark except for scattered torches. It will be silent, except for our hushed voices and the wind whispering through canyons and over the red desert sands. As we walk out of the camp, we’ll hear the sounds of livestock and meet up with our camels that will take us to a magical overlook as the rays of morning sunlight bring life to the rock formations and sand dunes of the Jordanian desert. Then, after getting memorable photographs, we’ll return to camp on our camels, just as Lawrence of Arabia did in this very place 100 years ago. After breakfast, we’ll drive northwest and enter the Dana Biosphere Reserve and the enchanting world of authentic Bedouin hospitality. Deep in this mountainous region, we’ll find the Feynan Ecolodge, named by National Geographic as one of the Top 25 eco-lodges in the world. Here, set against the rugged landscape, we’ll wander through untouched wilderness and unwind in the serene courtyards and terraces of the candle-lit lodge. As the sun sinks toward the horizon, we’ll walk into the hills to a great vantage point to view and photograph the sunset. As we set up our cameras, we’ll enjoy a cup of sweet tea, boiled over an open fire by a local Bedouin. Dinner will be a delicious, vegetarian meal enjoyed on the terrace under the clear night sky. After dinner, we’ll go to the rooftop deck where, if the weather cooperates, we’ll be able to gaze at, and photograph, the Milky Way. After breakfast, we’ll have a photo review and class on how to process images in Lightroom, and then we’ll venture out into a remote and beautiful wadi (valley) to put our photographic skills into practice, learning how to handle light and create effects such as starbursts. Lunch will be on the terrace, and then we’ll walk to a nearby Bedouin family’s home to experience their friendship and learn how coffee is an integral part of their interaction with others. We’ll watch coffee be roasted, ground, boiled, and then together we’ll enjoy the fresh brew, learning about the strong, ancient custom of Bedouin hospitality. There will be leisure time to use your new Lightroom skills to process your images, followed by dinner and another beautiful night under the stars. After breakfast, we’ll again board our four-wheel-drive vehicles to meet our bus and continue our drive north. Along the way, we’ll stop at the Kerak Castle. As we approach, the striking silhouette of this fortified town and castle will instantly make you understand why the fates of kings and nations were decided here for millennia. An ancient stronghold, Kerak has been a vital outpost of the Crusades, the Ottomans, and Islamic fighters and was known as Saladin’s favorite artillery position. After wandering through the castle and the dramatic lighting and architecture it offers our cameras, we’ll drive further north to the lowest point of ground on the planet… the shores of the Dead Sea. Here, we’ll enjoy dinner at our 5-star resort, and watch a dramatic sunset, weather permitting. We’ll wake early to photograph the first rays of sunlight illuminating the rugged Judean Hills across the sea in Israel. After breakfast, enjoy a relaxing experience floating in the Dead Sea, coating yourself with mineral-rich mud, and unwinding in the resort’s luxuriant pools. With your free time, you can opt for a luxurious spa treatment. In the afternoon we’ll explore the surrounding area as we take a photo drive and enjoy another vantage point for sunset. Today after breakfast, we’ll head further north to the ancient city of Jerash. This ancient Roman city is one of the most well-preserved cities of this era outside of Italy. Here, we’ll explore the timeless ruins of hilltop temples, long colonnaded streets and many theaters. History will come alive as we walk these ancient streets together. After lunch, we’ll head back toward Amman for some free time for shopping before dinner. Our final full day in Jordan! After breakfast, we’ll have a class on selling our photography, followed by free time to shop and explore Amman on your own. For lunch we’ll travel to East Amman where we’ll visit an Iraqi family—refugees from the war and fighting that forced them to leave everything, escaping with only their lives. As their guests, and hosted by a reputable non-governmental organization (NGO) that has worked with refugees for decades, we’ll hear their story and enjoy a home-cooked meal from their homeland. As their welcomed guests, sitting in their temporary home, sharing a meal, our eyes and hearts will be open to their plight and the plight of millions like them who temporarily call this country home. Back at the hotel, we’ll have our final photo review, then rest up and prepare for our farewell dinner and late-night flights home. You can schedule your return flight for departure that evening. Most international departures are late-night flights—around 1:00 – 2:00 am. Note that flights after midnight will be May 21 departures. If you prefer to have an extra day to relax, you can schedule an additional night at your own cost. We can assist with the booking. Special First Alert Discount: Save $800 with your special Discount when you sign up today. The full price of this workshop is $6,797, but you’ll pay just $5,997* when you apply the $800 First Alert Discount and register today. If your spouse or a guest would like to join you, he or she can do so for just $5,597. Easy payment plan: What’s more, if you’d like to take advantage of our easy payment plan, you can register today with a small down payment. Reserve a seat on the expedition when you put your name on our attendee list today. We’ll bill your credit card a small down payment today, and spread the rest of the payments out comfortably between now and when the workshop starts in May (one payment per 30 days). Airfare to and from Queen Alia Airport in Amman, Jordan. Meals on first day of arrival. If you arrive early or stay late, there will be an additional fee for your airport transfers. Extra accommodations, if you decide to stay additional nights. Spa treatments, laundry and other charges at hotels. Equipment – you must bring your own camera and equipment (e.g. laptop, notebook, etc.) A tripod is recommended for night photography. We pledge to offer top-quality expeditions at the best possible price. We create tours for travelers, not tourists—folks who want unique experiences they wouldn’t likely find on their own. And we strive to make each and every expedition better than the last. The only way we can ensure affordable tours without sacrificing these experiences is to offer them one at a time—improving on each one—which means we don’t publish a yearly expedition schedule on our website. Many other tour companies use a simple formula, designed to shuffle tourists from one place to the next. They’ll use the same itinerary year after year, without making modifications. And that’s not who we are. To keep our prices low and our itineraries fresh, we stay on top of the trends, deals, and best-value opportunities that we can get our hands on. This sometimes means we’ll put together a trip very quickly, and you might not have as much advance notice. But you’ll have a great price (oftentimes $2,000-$3,000 less than what you’ll find elsewhere), and a great itinerary. That’s our pledge to you! As with all overseas travel, it’s recommended that you’re up to date on all routine vaccinations. These include measles-mumps-rubella (MMR), diphtheria-tetanus-pertussis vaccine, varicella (chickenpox) vaccine, polio vaccine, and your yearly flu shot. The Center for Disease Control and Prevention (CDC) also recommends Hepatitis A and Typhoid for travelers going to Jordan. You can find all this, as well as more information pertaining to health precautions such as safe food and water practices, on the CDC Website. The Jordanian Dinar is the currency used in Jordan. Visa, MasterCard, and American Express cards are widely accepted for payments by most shops and restaurants around the country but paying with cash (Jordanian Dinar) is generally easier. In some establishments you may be charged a 3%-4% service fee for paying by credit card. ATMs are widely available and can be easily accessed near our hotels in Amman, Petra, and The Dead Sea, as well as at the airport. All rooms at our hotels in Amman, Petra, and at The Dead Sea are equipped with free Wi-Fi. The only place you will not have access is at our desert camp in Wadi Rum. Jordan’s electrical system is a bit confusing since it can use as many as five different types of outlets (Type C, D, F, G, and J)! However, the two most commonly used are Type C and G. The standard voltage is 230V and frequency is 50Hz. Check on the label of your electronic device (charger, laptop power supply, etc. )—most electronics made in the past 10 years will handle 110-240 volts. You will probably not need a converter (only an adapter to get your prongs into the sockets)… but please check your labels to be sure! We highly recommend insurance coverage for cancellation. This should be taken at the time you book the trip. We also recommend supplemental travel insurance to protect yourself in case of unplanned medical emergencies. We will send you more information after you book with us. It’s possible your credit card already covers you for certain things. We’ll send you advice on how to find out. U.S. citizens are required to present a valid passport when traveling to Jordan with at least one blank page for your entry stamp. Jordan also requires a single-entry travel visa for all U.S. citizens which you’ll get when you arrive. Canadians have similar requirements but please check online to know for sure. Attendees from other countries should check their application requirements online before registering. A visa will be provided for you when you arrive so long as you send us all your flight and passport details. We will ask you for this information before your trip. You will not have to arrange for a visa before you depart. All skill and experience levels are welcome, and the concepts introduced are doable by anyone. Point-and-shoot cameras or smartphones are welcome, but classes will be geared around DSLR and mirrorless cameras. If your camera is new, it is helpful to become familiar with it before the expedition. We’ll send you a camera basics class before the workshop begins. But, don’t worry, we will do our best to get you comfortable with your camera by the end of your time with us. In Jordan, we will spend much of the time out and about walking, sometimes up and down hills, on irregular stairs, and often on uneven terrain. You should be able to walk comfortably for two miles and/or for at least an hour in these conditions. For our Jeep excursions in Wadi Rum, you should be able to sit and bounce for several hours on bumpy terrain. Parts of our excursion include riding on camels! You should have the energy and enthusiasm to ride these animals (with assistance!) or understand that you might want to sit out or stay behind. And lastly, Jordan is a desert climate with relatively low humidity. It is important to drink plenty of water while on the tour, even when you don’t feel especially thirsty. If you have any concerns about physical limitations, please contact a Great Escape Publishing staff member before registering. You can email us at workshops@greatescapepublishing.com or call (561) 860-8266. Please note: Jordan is a Muslim nation and, as such, has a culture of modesty. We’ll send more details about appropriate clothing, and a full packing list as we get closer to the event. Space is limited to just 12 attendees on this trip, so we strongly urge you to sign up today. It could be years before you get another opportunity to explore Jordan with such a small group of like-minded people—and, with an expert photographer (who knows this country inside and out) by your side! We’ve had a number of requests to save seats already—this program will fill up quickly! So please, register here now by clicking below or, if you have any questions, call our office today at (561) 860-8266 (Eastern time zone). Seats are first-come, first serve. If you love to travel and have an interest in photography, you have what it takes to become a successful freelance travel photographer. It’s that easy. The many successful folks who have attended one of our workshops in the past don’t know anything you can’t learn to do on this trip. You don’t need an expensive camera or lenses. And you don’t need photography experience to get started. Cancellation Policy: All our workshops and expeditions are non-refundable. If there is an emergency or a medical reason you need to cancel—and we can fill your seat with another paying participant before the event—we can offer you a workshop credit good toward another event in the amount of what you paid minus a $500 credit card processing fee. Refunds to your credit card are not possible.